As explorers, Jacques Cartier and Samuel de Champlain both loom large in the history of this country. Cartier “discovered Canada” and claimed it for France in 1534, exploring and mapping first the Gulf of Saint Lawrence and later the Saint Lawrence River. Champlain, for his part, set up the French settlement in 1608 that was to become Quebec City, and explored and mapped the Great Lakes. As Montreal bridges, however, the Jacques Cartier far outshines the Champlain. Most obviously, the Jacques Cartier was opened to traffic in 1930 and is still in good shape 80 years later. The Champlain was opened to traffic in 1962 and is falling apart only 50 years down the road. Their histories—and today’s proposals for rebuilding the Champlain—are a sad indictment of how some things have changed for the worse in Canada over the last hundred years. 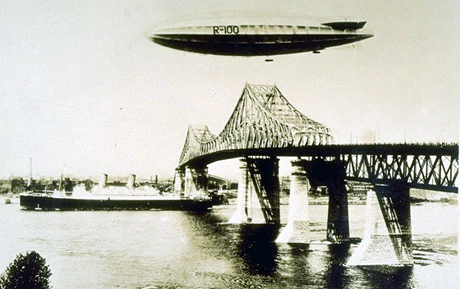 The groundbreaking ceremony for the Jacques Cartier Bridge was held on May 26, 1925, according to the website of The Jacques Cartier and Champlain Bridges Incorporated (JCCBI), the crown corporation that has managed and maintained—or failed to maintain—both bridges since 1978. The Jacques Cartier was completed almost a year and a half ahead of schedule, in December 1929 instead of May 1931, as planned. It cost $20 million to build, the equivalent of around $262 million in today’s money, according to the Bank of Canada’s Inflation Calculator. As we shall see, building a bridge of the beauty and stature of the Jacques Cartier in four and a half years for about a quarter of a billion in today’s dollars was quite an accomplishment. At 3.4 km in length with over 300 m of steel girders cantilevered and suspended between piers 24 and 25, with maximum clearance of just under 50 m and the main pillars rising up another 50 m above the deck, the Jacques Cartier towers majestically above Saint Helen’s Island and the Saint Lawrence River. The construction of the Champlain Bridge began in 1957 and was completed in 1962 for $35 million, the equivalent of around $267 million in today’s money, virtually the same as what it cost to build the Jacques Cartier. The Champlain is a less impressive structure, keeping low to the water for all but a short span across the Saint Lawrence Seaway, which opened in 1959. What the Champlain lacks in grandeur, though, it makes up for in length, clocking in at roughly 6 km, almost twice as long as the Jacques Cartier. "I’m not someone who thinks everything was better back in the good old days. Not only have computers, cameras, and cars improved, but the rights of women and minorities are far better respected than they were a hundred years ago. But neither can I embrace a Panglossian view that nothing of any import has been lost along the way." What about the factory owners and other proprietors whose land was needed for the construction of the Champlain Bridge? The JCCBI website says only, “Expropriation procedures also got under way,” and makes no mention of any quixotic attempts to stop them this time around. Technological progress is supposed to deliver more (and better) for less over time. This is certainly what has happened with personal computers in the last few decades. I can buy a computer today for less money, in inflation-adjusted dollars, than my Commodore 64 cost when I was a kid, and it will be orders of magnitude more powerful. A similar story could be told about televisions, cameras, and other consumer electronics. In 1908, the Model T Ford cost $850 (around $20,000 today) and had a top speed of about 70 km/h. I can get a much better, faster, more fuel-efficient car today for significantly less money. What about Montreal bridges? It’s hard to compare the price tags of the Jacques Cartier and the Champlain, given their different designs and lengths, but it sure seems as if construction quality went down from the late 1920s to the early 1960s. And since then, prices seem to have gone through the roof. La Presse reported in May on a document it obtained stating that a new Champlain Bridge would cost $5 billion and take at least 8 years to complete! A BCDE report released in July puts the amount at a somewhat more modest $1.3 billion over 8 to 10 years, but even this is five times the original cost and twice the original time frame. I’m not someone who thinks everything was better back in the good old days. Not only have computers, cameras, and cars improved, but the rights of women and minorities are far better respected than they were a hundred years ago. But neither can I embrace a Panglossian view that nothing of any import has been lost along the way. The equanimity with which we expect and accept violations of private property and huge cost increases and overruns and delays in government infrastructure projects is an indicator of what has been lost: the character to stand up and fight against government corruption and incompetence. The point of revisiting our history is not to dwell on what used to be, but to learn and grow. As my colleague Gennady Stolyarov II writes in an article reprinted elsewhere in this issue of Le Québécois Libre, we who value individual liberty “want a better future, building on everything that we can find to be of value in all prior eras.” Let us remember that there was a time not so long ago when private property was respected and bridges were built to last and finished ahead of schedule for a reasonable price.